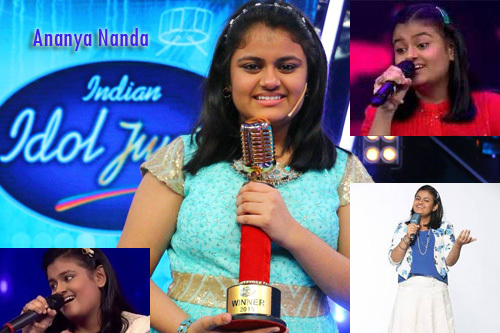 Yet another season of Indian Idol Junior came to an end on Sunday, 6th September 2015, but not before giving India an extremely talented young singer in the form of Ananya Nanda. 14 year old Ananya defeated co-contestants, Nahid Afrin and Nithyashree Venkataramanan, to emerge as the winner of season 2 of this singing talent hunt show for kids. Ananya, who hails from Odisha, was eliminated in the theaters round in 2014, but made it to the finals this year. The daughter of a government employee and a housewife, this young girl from a middle class family aspires to be a scientist some day. But for the time being, she has won the hearts of all the judges on Indian Idol along with millions of audiences, with her sincerity and dedication of her singing. As the winner of the reality show, Ananya, gets to take home a trophy and a contract worth Rs 10 lakh from Sony Entertainment Television. Speaking on the occasion, an extremely elated and surprised Ananya said that it was the best moment of her life. She also thanked the show for providing her the necessary training and mentoring to have reached this level and also the viewers for having showered her with their love and blessings. Ananya also stated that she loved Vishal Dadlani the most amongst the judges on the show and is a great fan of singer Shreya Ghoshal as well as Arijit Singh. The young singer also pronounced that veteran music composers, Klyanji Anandji acted as her lucky charm.